There are more than 300 types of parrots around the world. Many bird hobbyists raise companion parrots as pets, attracted by their colorful plumage and high level of intelligence. Popular species include macaws, cockatoos, Amazons and parakeets. Occasionally, a parrot may experience diarrhea. Learn how to identify and cure diarrhea through lifestyle and diet changes, as well as when to contact a veterinarian. Determine whether your parrot has polyuria or diarrhea. It is easy to confuse the two. Diarrhea is when the parrot's feces are a soft, formless mass. Polyuria is very watery feces but the feces retain their shape within the water. Decrease stress. Stress may induce diarrhea in your parrot. Move the parrot's cage to a quiet area. Reduce human activity around the cage. Consider playing a soothing background noise, such as soft classical music. Schedule a routine for feeding the parrot and cleaning the cage so that the parrot gets used to your daily rhythm. Note what you are feeding the parrot, and change the diet where appropriate. Reducing the amount of fruit fed to the bird may encourage firmer stool production. Rotten, spoiled or moldy food can also cause diarrhea. 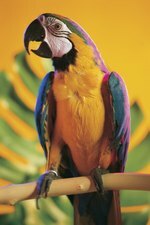 In addition, your parrot may have diarrhea if you are feeding the bird antibiotics to treat a disease or infection. Feed the parrot an enriched parrot food, such as those manufactured by Kaylor or FM Browns Nutrition. Diarrhea may be caused by a nutritional deficiency, such as a lack of calcium. Supplementing the parrot's diet with vitamin-enriched feed may be sufficient to stop diarrhea. Enriched feed can be purchased at a pet store or from an online retailer. Check your parrot's toys and cage. Lead poisoning can cause diarrhea, and lead is found occasionally in various household items and pet supplies. Contact the manufacturer of your bird cage and bird toys to see if there were any recent recalls of the product due to lead content. Take your parrot to see a veterinarian if the bird does not return to normal bowel movements after several days. Diarrhea may be a symptom of a greater health problem, especially if accompanied by secondary symptoms such as feather loss, listlessness or blood in the feces. For example, an internal hernia, fungal infection and roundworms can all cause diarrhea in a parrot. Contact the American Veterinary Medical Association to find an AVMA-accredited vet.